In many industrial applications it is vital to characterize how viscosity depends on temprature. With its wide operating range, hts-VROC® is an ideal tool for testing the effects that both temperature and shear have on your samples' viscosity. Our high-temperature and high-shear unit, hts-VROC®, exploits VROC® (Viscometer/Rheometer-On-a-Chip) technology to characterize engine oils under conditions similar to those in combustion engines. hts-VROC® provides a full shear rate spectrum of your synthetic oil viscosity as a function of temperature. Engine oils play a key role in the lubrication and performance of internal combustion engines. Lubricants reduce reduce wear on moving parts, inhibit corrosion and improve sealing and cooling. Characterizing lubricant properties is fundamental to properly establishing performance and degradation under use. Our new system provides the features and specifications of the revolutionary m-VROC® viscometer, with the added capability of testing at temperatures as high as 105°C (with 125 °C available upon request). In this technical application note, we demonstrate the suitability of hts-VROC® to characterize engine oils, and other complex fluids, over a wide range of shear rates and temperatures. 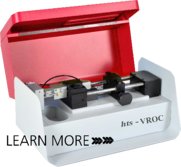 VROC® technology is a powerful tool in rheological characterization of fluids at high shear rates that are not accessible by conventional rheometers and viscometers. As an example of hts-VROC® capabilities, we present results for two new, multi-grade, synthetic engine oils, and one used oil. Viscosity Range: 0.2 - 100,000 mPa-s.
Shear Rate Range: 0.5 - 1,400,000 1/s. Download the Application Note to See More!